I am all for following the rules but not when it comes to fashion. I believe that one’s wardrobe should be a reflection of their own personal style. The age old rule that you can’t wear white after Labor Day is totally outdated. Fashion is ever changing and it doesn’t have to follow rules. The choice to wear white during any season is yours. This look is just an example of how you can wear white during the winter months. 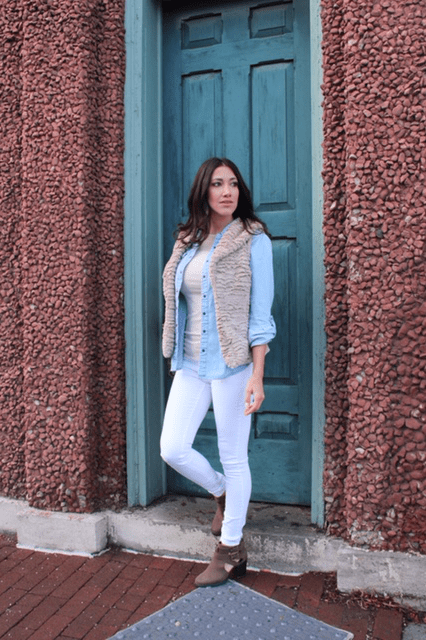 I’m featuring white skinny jeans by BLANKNYC, a cream colored top from Express and layered with a denim button down and a super soft, beige, faux fur, vest (both staple pieces in my wardrobe). It’s all about layering, especially with this wacky New York weather. When it’s 70 degrees one day and 20 degrees the next, you need to be prepared for anything, and layering is the answer. Simply add or take away a layer depending on the weather. 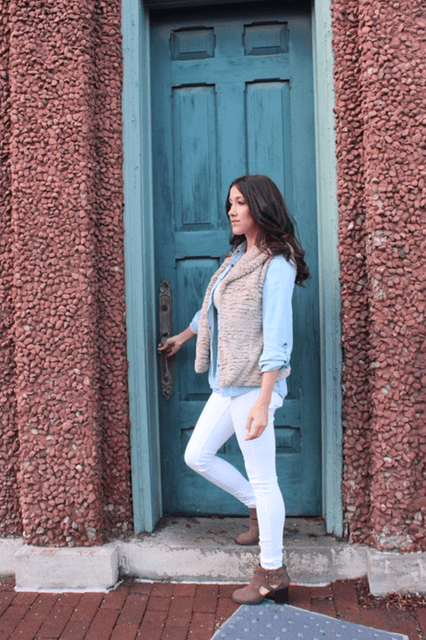 This denim button down is so versatile. It can be worn over a flannel, a tee shirt, on it’s own, or a dress….so basically anything. I even take it on vacation with me and throw it on over my swimsuit by the pool. 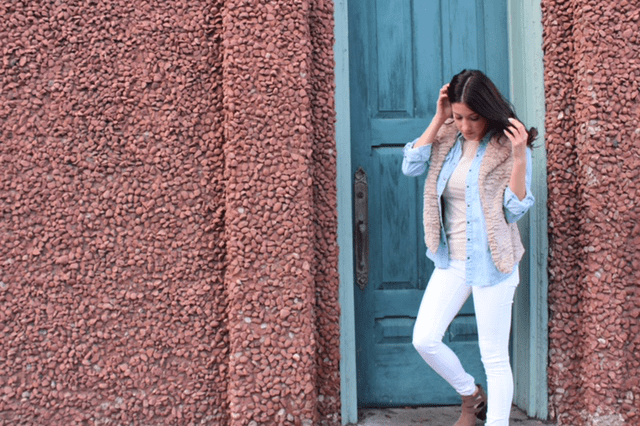 Get your white on and layer away! The cold weather of winter months make it a challenge to be cute and stylish. But scarves, which have become a must- have accessory for any season, combine warmth and style. This cold weather street style is effortlessly casual and chic. 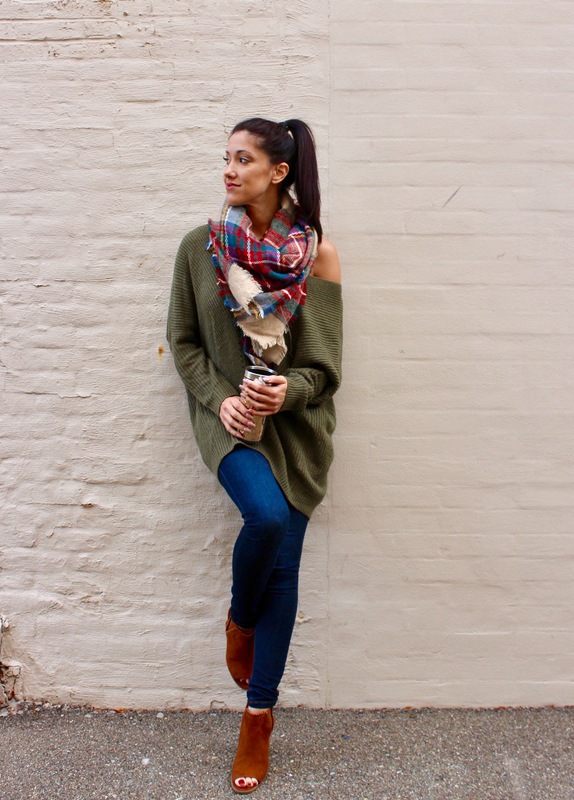 In this look I am wearing dark skinny denim, chestnut peep toed booties and an over-sized, off the shoulder, olive colored, sweater. Capping off this ensemble with a blanket scarf from Zara, which pulls it all together. You will love this scarf. It is super soft and cozy with vibrant colors in a plaid pattern to spice up the other earth tone colors. It’s perfect for fall and winter. Copyright © 2016-17 Alisa Parmenter. All Rights Reserved. Powered by WordPress and WordPress Theme created with Artisteer by Andy Parker.